I can't for the life of me get this program to compile. addScore(double pScr) // is a convenience method that adds a single score to the scores ArrayList as a time. calculateTotalScore() //is another convenience method that calculates a Diver's total score according to the rules below regarding how the total score is arrived at. toString() //build's a string consisting of the Diver's first and last name and all the Diver's individual scores contained in the scores ArrayList and the Diver's resulting total score. I've provided you with DiverTester class that will effectively test your Diver class. This class will read the provided data file, create instances of Diver objects and populate them with the data as it's read from the data file. 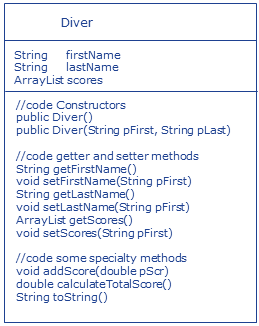 The DiverTester class will store the created Diver objects in an ArrayList of it's own. Once all the data has been read and the ArrayList of Diver objects has been populated perform the same processing as required for Assignment 10. For each Diver output the diver's name and total score using the provided scoring rules. Each contestant's score is calculated by dropping the lowest and highest scores and then adding the remaining scores. Format each diver's total score to two decimal places. So for example, the output for Chen Ruolin below would be: Chen Ruolin – 56.90 points. Now, I know what I have is rough, but I'm at a loss for where to go from here, please help! I would look into these four sections of your code. The body of the method could be this.score = score i don't know where you get pScr from. Not the answer you're looking for? Browse other questions tagged java file-io arraylist or ask your own question.